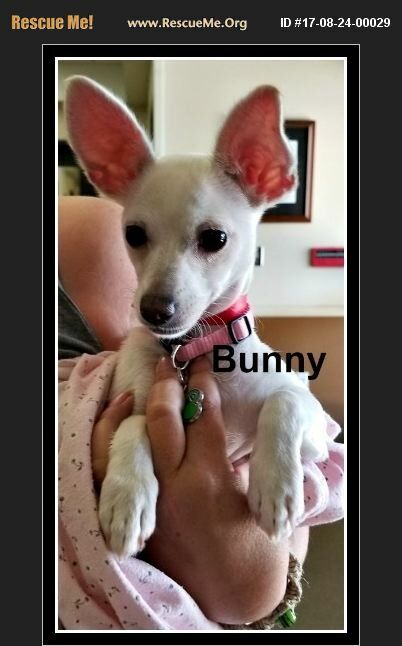 Bunny is a small puppy who was born around June 28th. She was rescued from a high kill shelter after there was no public interest. She has your normal puppy energy and would do best with no small children. All our dogs are altered, micro chipped, fully vaccinated and dewormed. You can fill out an adoption application online at our official website www.dogsinneedorg.com All of our dogs are in foster homes and we have no paid staff. If you have questions concerning a specific dog, PLEASE fill out an application and the foster parent will be in touch. We will not arrange any home visits with any of our dogs until your application is processed. Please understand our foster parents are precious to our rescue; without them we cannot function, so we do our best to not burden them with multiple appointments. Our foster parents will choose their top 3 applications and arrange home visits with these applicants. The adopter will be chosen at that time. . We want to make sure our little furry ones are placed in their 'forever home' and never have to go through a rehoming again! A dog is a lifetime commitment. The dogs in our system find themselves there, for the most part, because their humans did not have the same loyalty to them as they did to their owners. We do not take the adoption process lightly, and will do everything in our power to make sure the dog is placed correctly the first time around for your sake and theirs. Thank you for choosing to adopt not shop!